As I mentioned in my last post, we had a great time on the weekend, hiking and fishing – unsuccessfully, those fish were very tricksy – in the Snoqualmie National Forest. It was a short hike, only 5 km but carrying fishing gear can get annoying and it was quite warm so for our sake and the dogs’ it was probably a good thing we didn’t choose the 14 km hike instead. 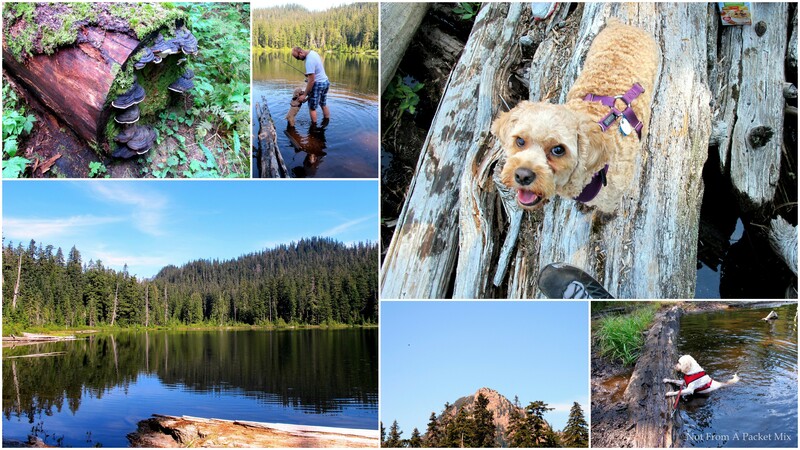 For anyone who is local, we hiked to Lodge Lake from the Snoqualmie Pass Ski Lifts, near Alpental Rd. A huge thanks to my friend Chath who told me about this awesome phenomenon – that frozen bananas turn into ice cream. She has since posted her original and baby friendly version on her blog and very kindly gave me permission to have a play with it and record it here. Lactose is a FODMAP, so if you malabsorb lactose then use lactose free yoghurt in place of normal yoghurt. If you want a vegan/dairy free/paleo version, omit the yoghurt or replace it with the same amount of coconut cream. I am planning on trialling a little avocado in it’s place sometime soon. I’ve seen it done before, I just need to figure out amounts. Bananas that are over-ripe can be higher in FODMAPs, so if you are extra sensitive then use an eating banana rather than a cake banana. It will just taste a little less like bananas than this version. 1 banana per person (or as tolerated). 1 tbsp. plain, lactose free or Greek yoghurt – this can be omitted or replaced with coconut cream for the dairy free/vegan/paleo option. Chop and freeze your bananas for at least 8 hours to really freeze them, otherwise they will produce a cold banana custard texture, rather than ice cream. Don’t freeze unpeeled bananas, they don’t thaw well. “Cake” or “over-ripe” bananas are best, as they have a stronger flavour. If, however, you cannot tolerate the extra sugar present in very ripe bananas, normal bananas are okay. 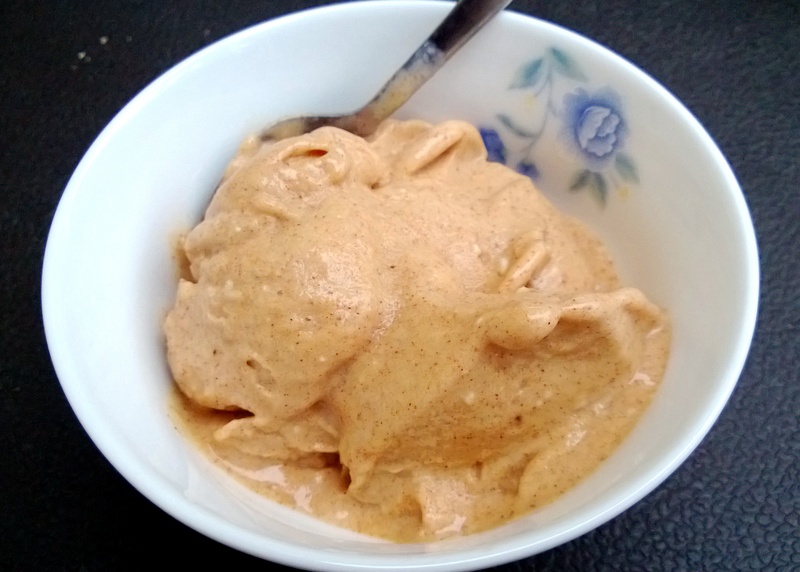 Once your bananas are frozen, put them in a food processor, along with the yoghurt and cinnamon and blend until smooth and creamy. You’re basically done. Scoop it out and either enjoy it right now or place it in the freezer for 5 or so minutes to firm back up a little first. How easy is that?! I’m planning on attempting a strawberry vanilla version next, or maybe a chocolate banana. The possibilities are endless! This entry was posted in Breakfast, Ice Cream, Sweets and Desserts and tagged chocolate, cockapoo, custard, dairy free ice cream, dessert, Dog, fish, FODMAPS, food, fructose friendly, fructose malabsorption, fruit, gluten free, guilt free, healthy, home-cooked, homemade, ice cream, low calorie, low fat, low fructose, low sugar, no added sugar, paleo, Seattle, strawberry, summer, sweet, vanilla, vegan, vegetarian, warm weather. Bookmark the permalink.